Our fish team recently headed out to sea in Alaska to learn about the local fish species. In addition to catching a 45 lb king salmon (the largest catch of the day! 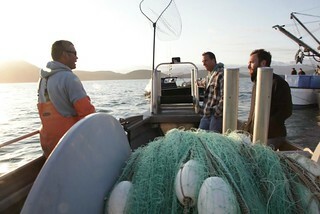 ), the team landed halibut, Alaskan red snapper, and cod. Our Senior Fish Buyer, Mike Kanter, shared his first-hand fresh adventure with us below. As the Seafood Merchant at FreshDirect, it’s important for me to bring our customers not only great-tasting, fresh seafood but also sustainable ones too. 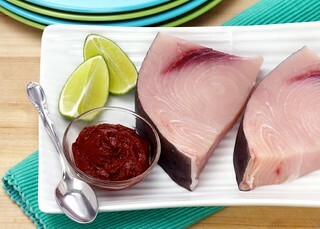 We just got our first batch of sustainably caught swordfish in the shop. These fish come to us from Nova Scotia and from the first swordfish fishery to be certified sustainable by the Marine Stewardship Council (MSC). Here fishermen use a traditional fishing method, harpooning, where swordfish are identified one fish at a time and then target them with a harpoon attached a line. This fishing method assures that fisherman only catch larger mature swordfish while eliminating non-targeted species or by-catch…. 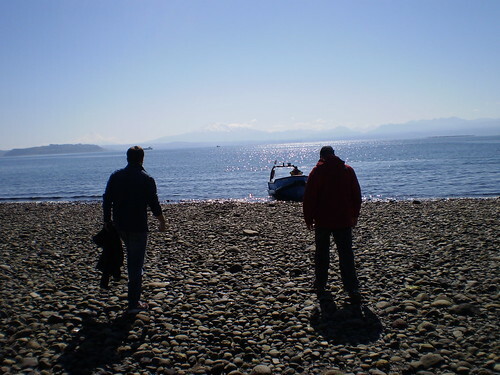 David and Jeff go fishing for Wild Alaskan Salmon. 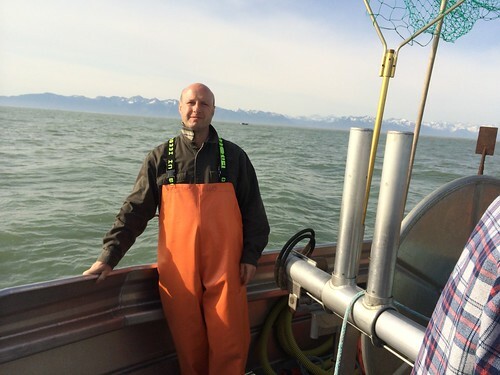 Our seafood experts, David and Jeff, were in Alaska late last week to check on (and catch!) this season’s wild Alaskan salmon from the Copper River. Copper River salmon are among the richest, tastiest fish in the world. And they can’t come any fresher—the fish that David and Jeff caught are in our stores right now! David and I arrived in Cordova, a small fishing village near the mouth of the Copper River in Alaska. The charming town is on an inlet surrounded by majestic mountains. There are no more than a couple thousand people, a harbor full of fishing boats, and a number of docks and processing plants…. Following the launch of the Verlasso salmon line in mid-September, our seafood category experts, Jeff Ludwin (Category Manager) and Marc Sirois (Operations Director), had the opportunity to travel to southern Chile to meet with the fisherman growing this one of kind harmoniously-raised salmon. As the exclusive supplier for Verlasso, our team wanted to ensure we were providing the very best salmon for our customers. By visiting their farms, facilities and operations, Jeff is also able to share the Verlasso story with you. We traveled from JFK to Puerto Veras (a small port city and commune in southern Chile) to visit with the Verlasso farms. We first visited the salmon hatchery in Puerto Montt. There we witnessed the grow-out in land-based recirculating tanks before being transferred to open sea pens. Here the salmon are raised in fresh water from egg to smolt. After about a year the smolt are then transferred to the ocean for a period of 12 to 18 months where they grow to adult salmon….